According to a legend that emerged in the 12th century, the two sons of Clovis II revolted against their father after he had set off on a crusade. Condemned for their rebellion, they were punished in accordance with their sin, and were deprived of their vital force. The operation consisted of ‘revmoing their life force’ them by burning the tendons of their muscles so that they could no longer move. Their parents, moved by pity, then decided to surrender them to the grace of God. They had them placed in a small boat with no oars or rudder, and abandoned them to drift on the Seine. This is the scene chosen by the artist: rejecting the literal interpretation of the text, where a servant accompanies the princes (this character can be seen in one of the preparatory sketches), he isolates the recumbent figures in a vast and dreary space where sky and sea meet. 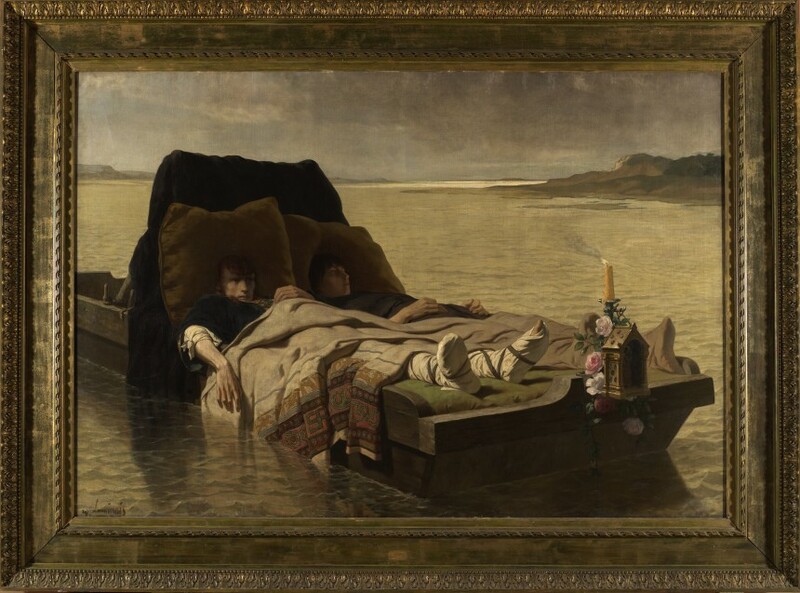 The two inert princes are warmly covered by a blanket with Merovingian decoration on the boat, which contains velvet cushions. The ever-burning candle behind a reliquary with flowers indicates God's protection, while in the distance a white dawn announces a safe refuge: a monk from the abbey at Jumièges will find them and take care of them, and they will live out a life of holiness there. This picture is a replica by the artist of the painting's first version, exhibited at the Salon of 1880 and immediately bought by a museum in Sydney. The Rouen version was acquired at the post-mortem sale of the artist, who seems to have wanted to keep a copy of this outstanding work.